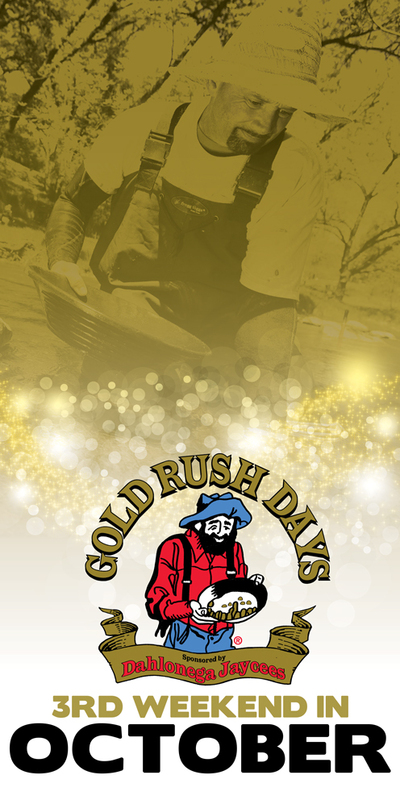 Gold Rush Days are always held the third full weekend in October. It is a time for thousands to come and see fall colors peaking and celebrate Dahlonega’s 1828 discovery of gold. Over 300 art and craft exhibitors and food vendors gather around the Public Square and Historic District in support of this annual event. It is estimated that a crowd of over 200,000 visits over the weekend to join in the fun and excitement! The Gold Rush Days Festival has been voted one of the Top 20 Events in the Southeast by the Southeast Tourism Society. Join us in downtown Dahlonega on October 19-20, 2019 and you will see why! Although The Dahlonega Jaycees produce this festival each year, we can’t take credit for its continued success. Volunteers, Vendors, Performers and Contest Participants, Festival-Goers, Advocates, Gracious Downtown Merchants and Restaurant Folks, Officers and Emergency Service Providers, City and County Partners, Locals and Out-of-Towners… ALL OF YOU contribute to the success of this event each year. We hope you know how grateful we truly are for each of you and the incredible impact your role in this festival has on our community, not just for one weekend in October, but all throughout the year. On behalf of the Dahlonega Jaycees, we can say with much sincerity, THANK YOU! THANK YOU! THANK YOU!